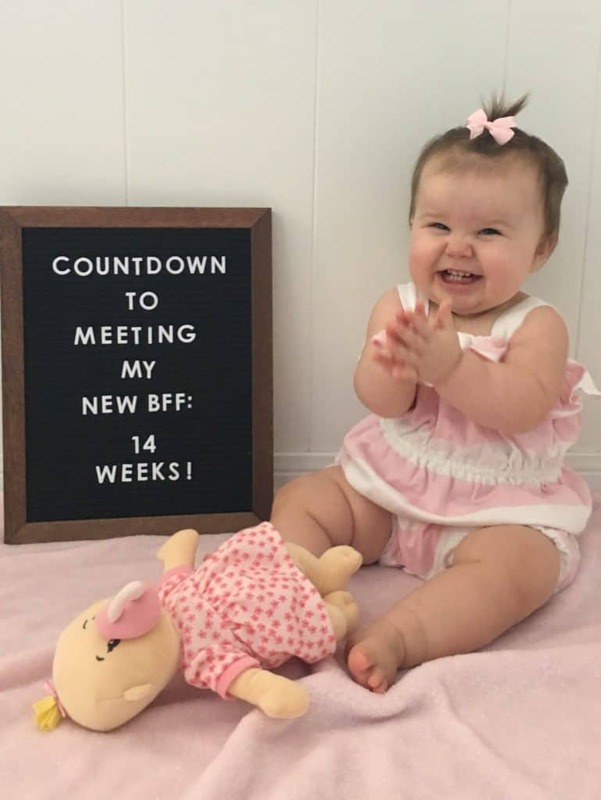 My first daughter just just 15 months old when her baby sister came home to join our family. To say that I was nervous about bringing home a baby while I had a daughter slowly entering “toddlerhood” would be an understatement. I was worried Emmy would feel neglected. The thought of this made me cry on a few occasions (thanks, pregnancy hormones). But I did my research. I reached out to family and friends who had also had two babies under two years and asked for advice. Over the next few months, as we prepared for Emmy’s little sister to arrive, we made some calculated moves and worked hard to prepare her for her future big sister duties. So we got her a baby of her own. I joked with my husband MANY times during the day, I interacted with this “baby” in a way that I would be totally embarrassed for him to see! While Emmy would be playing, I would hold and rock the baby. We would do diaper changes on the baby together. We would bottle feed the baby and burp her and we would put her down for naps. I would have to remind Emmy that we couldn’t go in the room because baby was napping. Baby came just about everywhere with us and was rarely found far from Emmy’s side. We also read ALOT of books about becoming a BIG sister. Some of our favorites were I’m a Big Sister, Little Miss, Big Sis, and we love ALL Mercer Mayer books (Emmy likes to find the bugs on each page) so we got a copy of The New Baby. 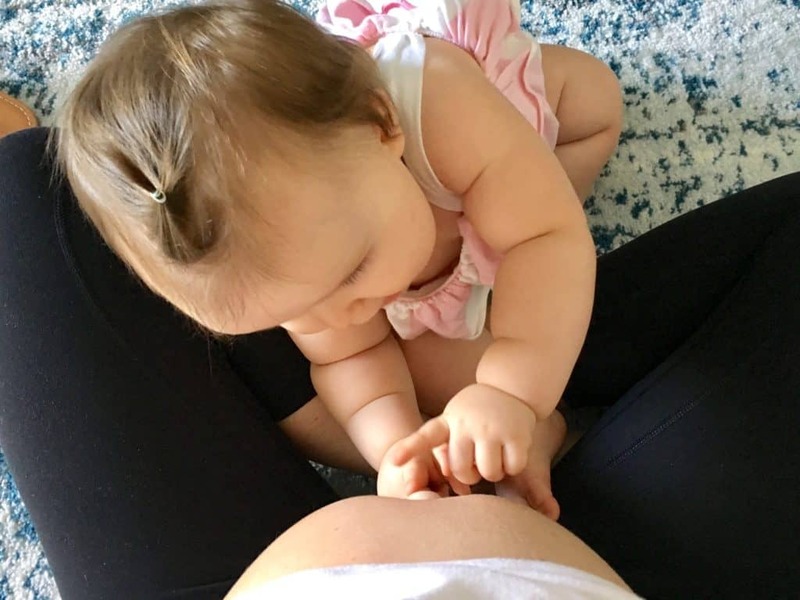 We also talked alot about mom’s belly. We talked about how sister was growing and very soon, she would be here, in our house! I would ask Emmy where her room was going to be (which she always loved to play in). We would spend time in little sisters room and look at her clothes and crib. I would always be overly excited when I talked about sister coming. Were we a little overboard with it? Maybe. But it was totally worth it. YES! More on the relationship with the real baby below. One of the BEST pieces of advice I was given by a friend was to make the initial meeting between big sister and little sister NEUTRAL. 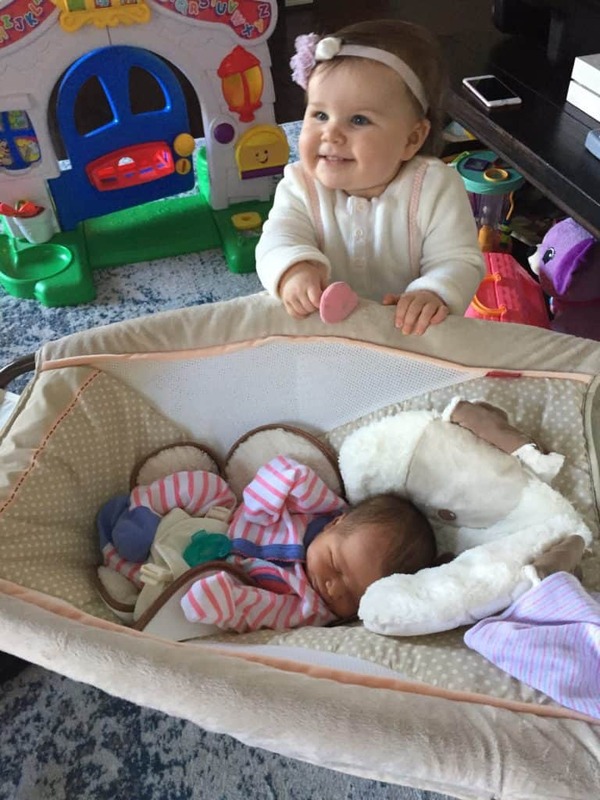 Whether they meet for the first time in the hospital or at home, have baby resting in a bassinet or rock n’ play and bring big bro/sis over to see them. It can be alarming for them to walk into a room and see THEIR mommy holding another REAL baby. We continued on this “neutral” setting quite a bit. If Emmy wanted to see Nora, we would place her in her rock n’ play and either dad or I would stand next to Emmy while we looked at her. 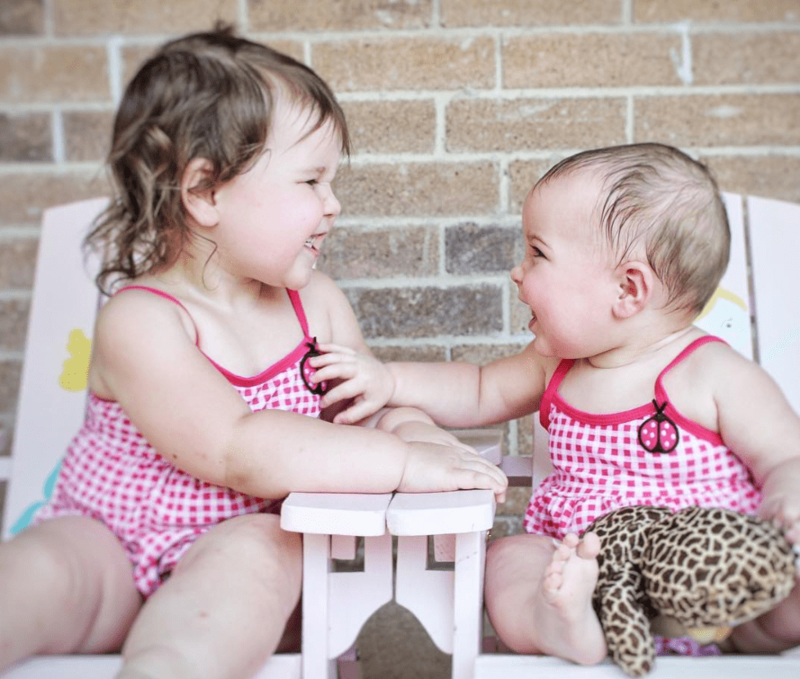 We would encourage her by saying things like “that’s your baby sister, you have to help us take good care of her”. Being home as a family of four was surreal. Before Nora came home, we taught Emmy to crawl up the stairs on her own. We would, of course, walk behind her as she went up. We got a second rock n’ play and had one upstairs and one downstairs to keep us from constantly moving it around. I emptied out a drawer near my breastfeeding station and filled it with fun things for Emmy. This helped me keep her close and in eye sight during breastfeeding sessions. Meal Prep was a HUGE help, even more than when we were first time parents. For some great freezer meal ideas, see this post. A good baby carrier is a must with two little ones. I took Emmy for walks in her little push car, folded laundry, even changed Emmy’s diapers with Nora strapped to me and sound asleep. With one baby, I would have been able to leave her in her swing or rock n’ play while I did other things, but in this case, I couldn’t take my eyes off of Emmy with Nora in reach. My go to carrier is the Baby Bjorn. This is tough for me to admit, but we did make a pretty big mistake there in the first few weeks. My husband and I thought we had it all figured out, he would bathe Emmy, feed her dinner, put her down to bed, get her up in the morning and make her breakfast, all while I tended to our newborn. We basically split the kids. He took care of Emmy, I took care of Nora. It only took about a week and a half for me to start feeling the resentment from Emmy. She only wanted daddy. ALL.THE.TIME. If dad was holding her and I tried to take her, she would instantly cry. Everything was DAD, DAD, DAD. Meanwhile, I’m over here, sleep deprived and flowing with all sorts of postpartum hormones and it absolutely broke my heart. Here we thought we were ROCKIN’ this two under two thing because the ship was running smoothly, but in reality, it was hurting my bond with Emmy. With some changes to our routine, I quickly started to see a difference in our connection. I began bathing Emmy each night and rocking her to sleep.. I also started taking her out to breakfast or lunch once or twice a week while my husband was still on paternity leave. Obviously, I had to have a freezer stash built up for baby Nora at home. I had heard of family’s spending “special time” with the first-born before the baby, but after the baby comes is so important. Now, I can’t tell you everything has been perfect. There have been plenty of pokes on the eyes and hair pulling (by BOTH girls). But there really is a great bond between the two of them that I love to watch.